Lyle: In this lesson you'll explore the use of arpeggios. First you'll learn several lick examples, and then put them together in a solo using several of the techniques I've covered in the past lessons on Improvising. An arpeggio is the notes of a chord. If you had an Am chord to solo over, the notes that make up that chord is: A-C-E, the root, b3 and 5 of the A minor scale. Play back this next TAB file on the virtual neck. It will display all the A-C-E notes found on the fretboard. These are the notes that make up the A minor arpeggio. Lyle: As you can see, there are a lot of notes! Next you'll learn an example lick using just the As and Cs. Lyle: Now you'll add the E note to this lick. This is all the notes needed to make an A minor arpeggio. dj: Hey, since my guitar doesn't go to 24th fret what should I do? Lyle: Grab the 22nd fret and bend up a whole step. Lyle: This short solo uses a couple of simple concepts or techniques. 1. Theme and Variation. During the first 4 measures, you're repeating a theme, climbing higher each time to create a simple variation. 2. In the middle of the solo, you're playing a couple simple blues licks, making it easy for the listener to relate too. 3. The last 3rd of the solo uses an ascending arpeggio pattern that peaks out on the very last note of the solo. Lyle: Also notice the composition of the solo started on a low note and finally ended on the highest note used in the solo. The jam track is using 2 chords, Am7 and Am6. Lyle: When you have two chord types such as these, it means you're in the key of G major. The Am6 gives us the clue. 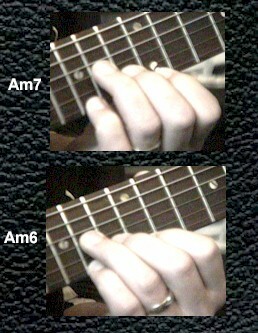 Am6 is the 2nd chord in the key of G. Why?.. more about this and other theory principles at a later time. Lyle: Since you are in the key of G major, you can use a Gmaj7 arpeggio over the jam track. The Gmaj7 arpeggio is made from the 1-3-5-7 notes of the G major scale, same as the chord tones of the Gmaj7 chord. Lyle: Here's an example lick using just the Gmaj7 arpeggio. The improv technique referred as "question and answer" is used in the first 2 measures, then continuing up and peaking at the 19th fret. Lyle: Now we'll add this lick along with the Am arpeggio. Lyle: Because of the Am6 chord in the jam track, the scale of choice would be the A Dorian minor. The A Dorian is the 2nd mode in the key of G. For more info on modes, check out my CD-ROM titled "Understanding the Modes". Here's the scale patterns for the A Dorian. Circled numbers are the A notes. Lyle: Here's an example using the A Dorian minor, Blues lick 1 and Gmaj7 arpeggio. Lyle: Learning just rock or blues licks can get you a long way when improvising, but memorizing scales, arpeggios and a little bit of theory can take you much farther. Lyle: That will wrap it up for this series on Improvising. I hope that between the last 5 lessons you have been able to learn a few new and inspiring techniques on how to improvise. StinkyG: Any suggestion on the best way to memorize scales? Just play through them until you have them down? Lyle: To help memorizing a scale, learn a couple ways to play it starting on different root notes, then try that in a different key. StinkyG: So memorizing the root notes is key as well. StinkyG: I see. I will give that a try. Thanks!